To view and print Publication Reprints, you will need the latest version of the Adobe Acrobat Reader installed on your computer. If you do not already have it, you can download it for free from Adobe. 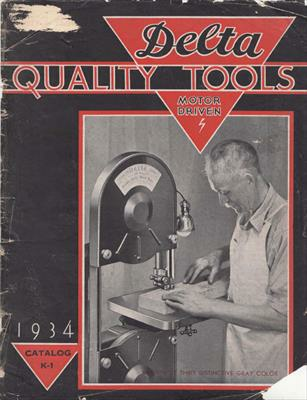 Publication Title: Delta Quality Tools - Motor Driven - 1934 Catalog K-1 Presume older than K-2, but no pub. date. Pages 22+ differ; K-2 has new drill press (p. 29). K-1 first w/ 14" band saw. While we do not charge for our service, it does cost us a considerable amount of money to bring all of this content to you. If you find the information on this web site useful, please consider making a donation to the Vintage Machinery web site. Donations will be used to offset the cost of bringing you this service to you and enhancing the site to include other useful features. Donations can be made through PayPal or by sending a check or money order to us.